The home on 605 Virginia Belle Drive is seated in the established Gentry Place subdivision in the heart of Smyrna, TN. This charming brick and vinyl home is encompassed by nearly half an acre filled with Cedar trees. The picturesque exterior of the home includes a wide driveway for multi-vehicle parking and neat landscaping. Since the front of the home does not directly face the main road, the front yard offers privacy and seclusion. Inside, the home hosts three bedrooms, three bathrooms, sizable living spaces, a screened-in porch, and a two-car garage. With its quaint setting and such comfortable living features, this house would make a lovely home for a family desiring to live in Smyrna, TN. 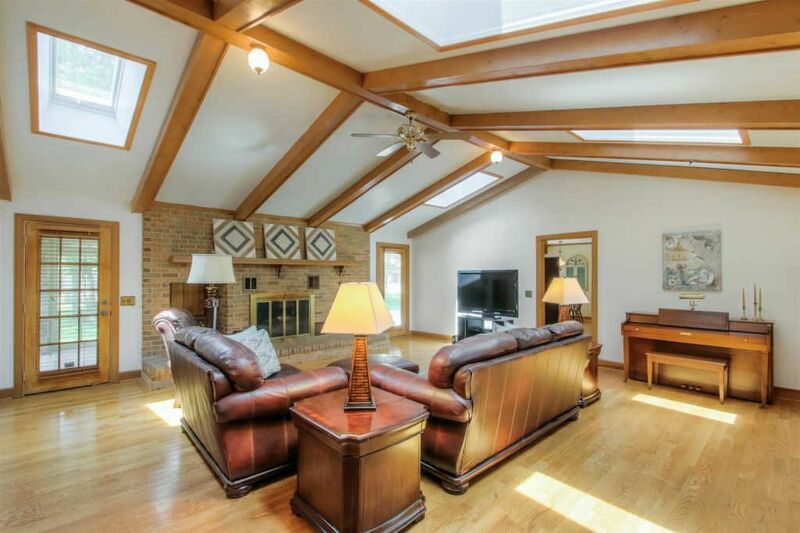 Stunning vaulted ceilings are the first eye-catching feature of this spacious living room. Several skylights flood the space with natural light and three additional light fixtures complement the warm tone of the room. This well-lit space is further enhanced by beautiful beams that line the ceiling. Below, a brick fireplace draws the room to an impressive focal point. This space is the perfect spot for entertaining a friend over a hot cup of coffee, or spending quality time at home with the family. 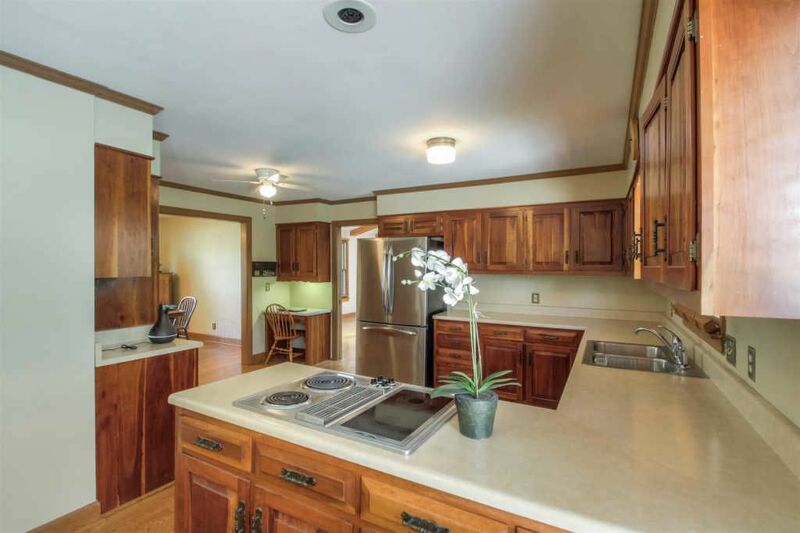 Gorgeous cherry cabinets line the walls of this roomy kitchen. There is plenty of countertop and storage space for meal creations of any size. The electric cooktop range, oven, compactor, and dishwasher also provide tools for easier meal-prep and clean-up. Additionally, this kitchen provides a sitting area that could easily become an adorable breakfast nook. Along with that space, it provides an individual desk and seating area, which would make a great homework space for the kids. This kitchen is a versatile, functional space for taking mealtime to the next level. The simplified dining room is immersed in a neutral tone with classic wood trim. This wood trim also encompasses the large window that serves as a lovely backdrop for the dining table. The size of the room lends itself to a table of substantial size, or a moderate table and additional furnishings. 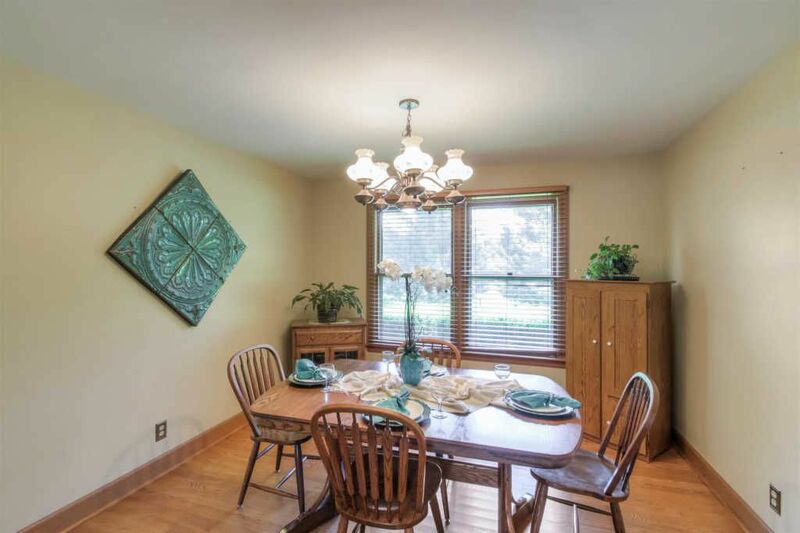 It’s a wonderful space for hosting dinner parties or celebrating special family occasions. The master bedroom is located in an exterior corner of the home, providing an excellent view of the beautiful outdoor landscaping. Natural light filters in through the windows and accompanies the simple light fixture in center of the ceiling. The hardwood floors and wood trim also give the room a comfortable, homey feel. 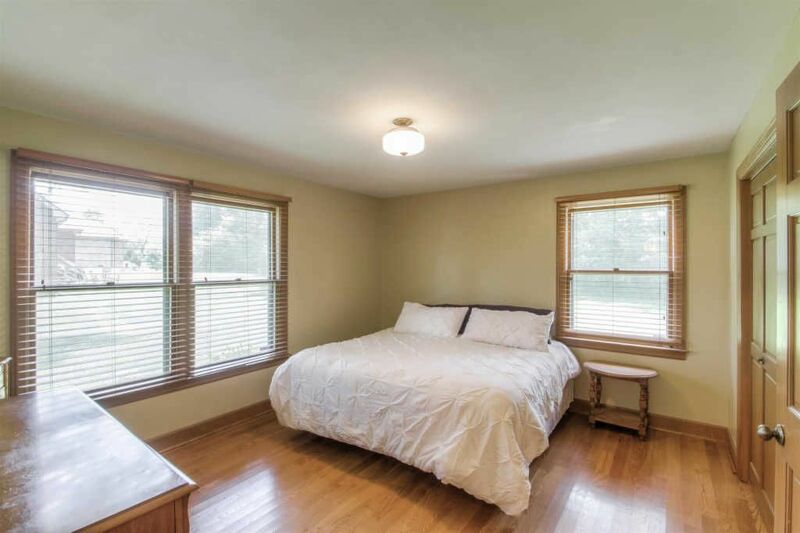 This room is also connected to the master bathroom. This luxurious space offers dual vanities, which are decorated with gorgeous light fixtures and a framed mirror. The bathroom provides a single, stand-up shower as well. Overall, the master suite has everything necessary for a cozy place to unwind after a long day. A: The kitchen is spacious with lots of counter space and cupboards with additional cupboards in the laundry room that adjoins the kitchen. The great room has a vaulted ceiling with skylights and an oversized fireplace. The screened-in porch on the west side has a nice stand of cedar trees along side it. A: Its location as well as floor plan. It is situated in a new neighborhood yet it has a larger lot with mature trees since it is the original house that owned all the land before the street was developed. It is a ranch style brick home with a larger than average garage. It is a quick drive to Murfreesboro by using either the interstate or side roads. A: There are lots of options right here in Smyrna: Omni Hut, Margarita House, O’Charley’s, Legends Steak House, Hickory Falls Wood-fired Grille and Bar, Cheddars, Cracker Barrel, Tokoyo’s Japanese Steak House, Chili’s, Cozumel, Las Siesta, Thida Thai, along with numerous other restaurants and fast food places. A: Kohl’s is probably my top choice for clothes and household items in Smyrna. We also have a Target and numerous other shops. For groceries we have Publix, Kroger, WalMart, and Food Lion. A: It is a relatively new neighborhood with few house being over 5 years old. It is a cul-de-sac which limits the amount traffic. We are within two miles of two boat ramps. A: When we moved here from Florida, we were looking for an area with good schools and accessible shopping in a suburban setting. Smyrna is a small town that is constantly growing. It offers several grocery stores, such as Walmart and Kroger. This provides residents with plenty of choices and a much easier shopping experience. There are also stores that fulfil other daily needs or items for leisure activities. These include places like Hobby Lobby, and Academy Sports. Those, along with the option to use Amazon Prime, make this a convenient area for busy lifestyle. This home is located in the Rutherford County school district. Students who live on 605 Virginia Belle Drive can expect to attend John Colemon Elementary, Smyrna Middle School, or Smyrna High School. For adults seeking higher education, there is a Smyrna campus for Motlow State Community College within a five mile drive from home. Middle Tennessee State University is also just 15 miles from the house. In fact, there are a total of five schools located 15 miles from Smyrna, TN. Also, for parents in need of a pre-school for their children under the standard school age, Smyrna is home to multiple facilities. Those options include: Community Christian Day School, La Petite Academy, Gingerbread House Christian Learning Center, and more. Smyrna has several educational opportunities for all ages.